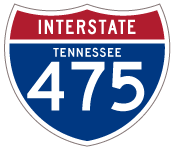 Knoxville Beltway – Route 475. http://www.tdot.state.tn.us/information-office/HotProjects/KnoxvilleBeltway/ Tennessee Department of Transportation (TDOT) project web site. Accessed July 31, 2002. “Beltway OK’d.” Knoxville News, November 11, 2003. Lansford, John “Knoxville Orange Line News” Online posting. March 27, 2005. news misc.transport.road. “TDOT Selects “No Build” Option on Knoxville Parkway Project.” TN.gov Newsroom, June 25, 2010. Page updated October 20, 2011.